Are Apple afraid of iOS? 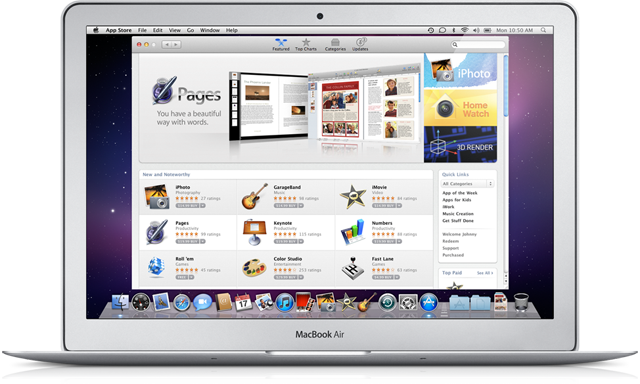 Yesterday, the Mac App Store launched and I have to say, it’s pretty darn good. It just makes sense. Why not follow the iOS model and allow users to quickly purchase software without the need for fiddly installations from DVDs? Software is suddenly more accessible, more attractive and, as shown in the case of Aperture, cheaper. But why? Why have Apple done this? I have a sneaking suspicion they’re a little frightened of their own creation: iOS itself. Its rise to fame has been nothing short of meteoric and dependence placed on it at home and in business immeasurable. This has caught many by surprise. Perhaps not least Mr Jobs. A month or so after purchasing my iPad I realised that I hadn’t touched my MacBook Pro for anything other than studio duties. Before the iPad, my trusty laptop would always be on hand, ready for a quick web surf or email, but now it had almost cemented itself to my studio desk, being asked only occasionally to run Logic. A waste, no? …enter the Mac App Store. Just what do you spend an HMV voucher on?